I could not be happier about this pasta recipe. Years ago, on a number of occasions I frequented an Italian restaurant called La Vecchia Verace and was so enamored by this particular pasta dish. I ordered it every time I visited. Occasionally I think about this pasta and living hundreds of miles away from La Vecchia Verace showing up is not an option. Having said that, the other day I was thumbing through a pasta cookbook “Four Seasons Pasta” by Janet Fletcher and there it was, a recipe for my favorite pasta dish served at La Vecchia Verace restaurant! This sauce is garden fresh and the end result is a texturally thick somewhat starchy bowl of summer comfort. Potatoes are boiled in with the pasta until al dente and gently tossed in a fresh tomato sauce with wilted arugula. 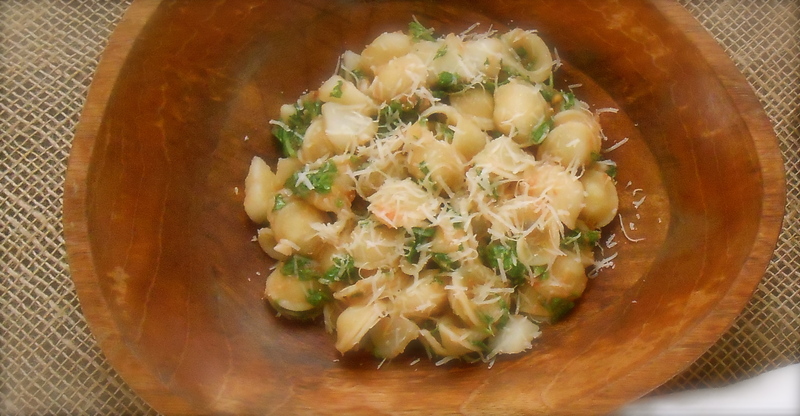 The potatoes break up just enough to nicely coat the orecchiette. In this cookbook I learned how to use fresh grated roma tomatoes to create a thick, tasty sauce. Roma’s are used because of their high proportion of flesh to juice and they are grated to produce a skinless, seedless pulp. A considerable alternative using fresh tomatoes while in season, rather than open a can of puréed tomatoes. To grate tomatoes, cut the tomatoes in half and scoop out the seeds and juice with your fingers. Holding the cut side of a tomato half against the grater’s holes, grate until only the thin skin remains in your palm. For this recipe reserve a cup or two of the pasta water before draining and use it after tossing with the sauce to help the sauce adhere to the pasta. It brings the flavors together and helps moisten the pasta without adding more oil. Heat olive oil in a large skillet over moderate heat. Add the garlic and hot pepper flakes and cook for about 1 minute to release the garlic fragrance. Add the tomatoes and salt to taste. Cook, stirring often, until the tomatoes soften and become sauce-like, 15 to 20 minutes, adding water if the tomatoes threaten to cook dry. Stir the arugula into the sauce and cook just until it wilts, about one minute (once the pasta is al dente). Bring a large pot of salted water to a boil over high heat. Add the potatoes and pasta and cook until the pasta is al dente. Set aside at least one cup of the pasta water, then drain the pasta and potatoes and return them to the warm pot over low heat. Add the sauce and stir gently to avoid breaking up the potatoes. Moisten with some of the reserved pasta water as needed. Divide among warm bowls, top with freshly grated grana padano and serve immediately. As soon as I started reading your post, I knew this was old school Italian. they love to use up garden supplies in a frugal way. Love the addition of grated tomatoes.. Looks good. I have learned that about the old way! Sometime I would like to acquire. I am so happy to have learned about grating tomatoes. Really makes a difference in the sauce. And by the looks of the dish you would not even know tomatoes are present! I never remember the pasta water! And I didn’t think you could grate tomatoes. Do they need to be somewhat firm? It was recommended to use roma tomatoes since they are meatier and less juicy. The tomatoes I used were nice and ripe and grated beautifully. Nothing more exciting than scoring one of your favourite restaurant recipes! We have a magazine here in Australia where you can write and request restaurant recipes. The chefs are (mostly) very happy to share them. Always an interesting read! This pasta sounds gorgeous. Orecchiette is one of my favourites. 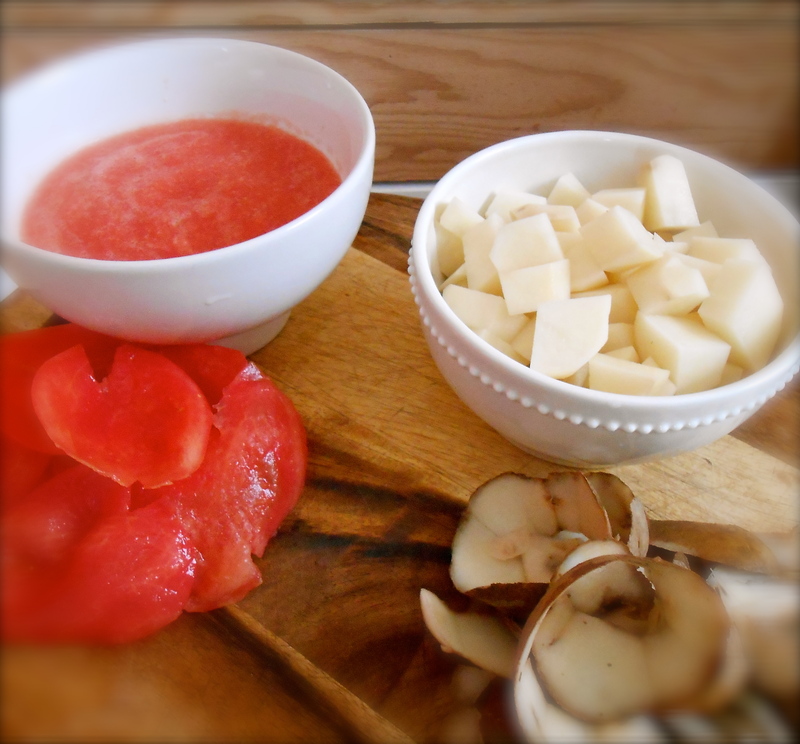 I LOVE your grated tomato tip – I’ve never come across that before. Such a great idea for simple Summer pastas. So true! Back when I used to order this pasta I thought it was mustard greens in the sauce. When I saw the recipe I uttered “arugula! of course”! The recipe in the book has nothing to do with the restaurant I frequented, it was merely coincidental it is the same dish. I love that everything is so fresh in this dish. The addition of the potatoes is quite clever too. Pinning this one for sure :) Have a great weekend! Thanks Suzie! You enjoy your weekend too! What a nice pasta dish! I have tried pasta and potatoes before in a Genovese recipe with green beans and pesto, but this version sounds fantastic and completely new to me! I love your tip on how to grate tomatoes. And I ALWAYS save some pasta cooking water, I love using it! The Genovese recipe sounds wonderful. I really like a crisp green bean in soft chewy pasta. The pasta water is literally pasta broth and is so useful! Good weekend to you Darya! hahaha. I knew what you meant! :) It is a really good tip. I’ve been doing this for some time now, especially for the non-tomato sauces which have a tendency to become dry. Oh good. Looking forward to your pasta dish post! I really like skinned sausages. Grating tomatoes is new to me and it is quite nice…of course you need the right tomatoes. I do appreciate can plums though. I usually just go that route. We do have a winner! I love Giorgio Locatelli and this was the first time I have ever seen him. Thank you so much for sending me that link. (I almost cried when they took that first bite of his “heretic” ragu!) I am going to seek out his book. Also, I am going to check out some more of that BBC series in Italy. I’m so inspired! I’ve never heard of grating toms before – what a great [grate!!] idea. Will try this when toms are in season. This sounds like a great dish, one that I’d surely love. I always find it interesting when pasta and potatoes are served together. Good tip about the pasta water. It’s saved more pasta dishes for me than I care to mention. The first time I had pasta with potatoes I couldn’t believe anyone would combine two starches like that. However, the flavor and textures are so nice together! I really like it. I love how the fresh tomato puree is clear and you do not even know it is present by looking at it, but you can taste it. I only learned about using the pasta water a year ago or so. I was always splashing chicken broth in before! Live and learn. :) Nice to hear from you John! Oh, I love orecchiette! And I love potatoes…Too bad I’m trying for a wheat, dairy and sugar free week! I know, it sounds crazy!! Well, today is day 7 and I’m tempted to try it for a couple of days more. I feel lighter, not so tired. But there is a reason for this insanity. I am supposed to reintroduce one food item a day to see how they make me feel. I have a chronic condition in the arthritis family which can be quite painful and debilitating at times…I’m hoping to discover if some of the foods I eat are the cause of the inflammation. I do miss eating whatever I want, whenever I want! I’m so sorry to hear of this. It must be so difficult to have this pain and not know the cause or if it is food related. I have read and heard of inflammation caused by foods we eat. I sincerely hope you find the cause Lidia and you are feeling better. I would gladly give up any food if it was causing me discomfort. Keep me posted and I’ll check in with you too. Thank you so much. Very kind of you to nominate me. I just saw your gorgeous polenta post! Congratulations. What a great pasta dish, I never would have thought to add potatoes with the pasta sounds absolutely delicious and I LOVE arugula!! Looks delicious and I love that gorgeous wooden bowl. I use Roma tomatoes all the time. I love the colour, fleshiness and also the firmness. I somehow can’t stand soft tomatoes. That bit about grating tomatoes, is it really easy? I usually grate apples and never enjoy the process. Now tomatoes is tricky can I just skin and blend them? Grating the romas was actually easier than it sounds. The author of the book I found this technique in said she used to peel, seed and dice fresh plum tomatoes until she found this easier way. It takes less time. After I scooped the seeds out with my finger it grated so easily and I had a fully intact skin in my hand when it was finished. Just hold the cut side to the grater and grate until only the thin tomato skin remains in your palm. :) Very easy! Hope you try it! 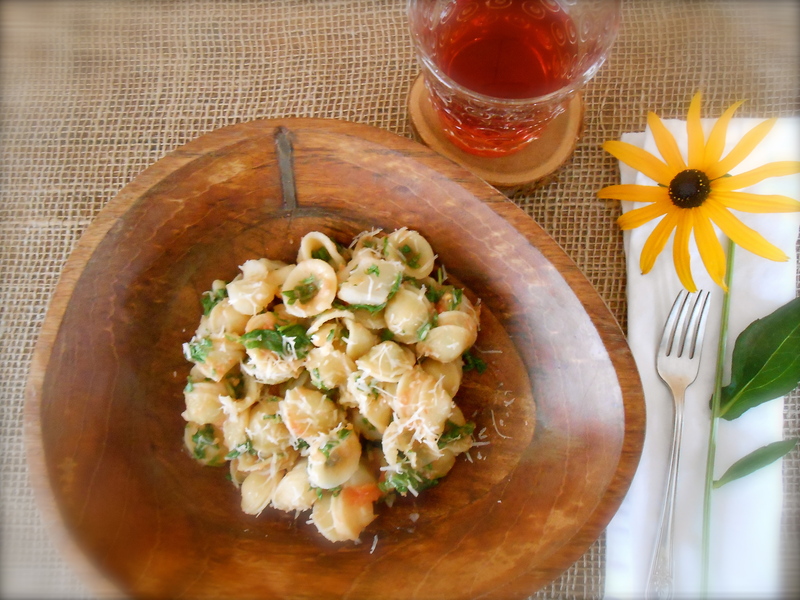 You are currently reading orecchiette with potatoes and arugula at COTTAGE GROVE HOUSE.